So here it is, the triumphant finale to ‘The Hunger Games’ franchise, and time for plucky heroine Katniss Everdeen (Jennifer Lawrence) to march proudly into the Capitol, aim her trusty arrow and loose it straight into the heart of that dastardly villain President Snow (Donald Sutherland). A rousing cheer, and we all go home satisfied. Except that ‘Mockingjay – Part 2’ isn’t that movie. This might be the most downbeat blockbuster in memory, a film that starts out pitiless and goes downhill from there, save for a fleeting glimmer of hope in the final moments. It’s a bold statement about the unforgiving nature of war, unashamedly political in its motives and quietly devastating in its emotional effect. 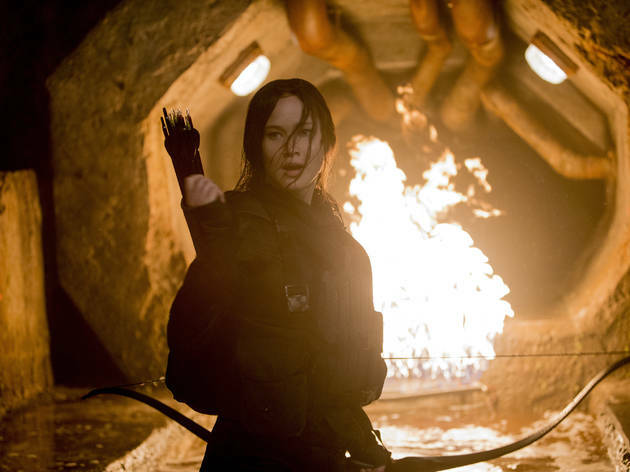 The action picks up right after the end of ‘Part 1’, with Peeta (Josh Hutcherson) suffering hallucinations brought on by Snow’s torturers and Katniss kicking against the restrictions placed on her by rebel leader Coin (Julianne Moore). The first half runs along fairly predictable tramlines, as Katniss slips her captors and joins the fray, bent on taking Snow down. There’s a truly nightmarish tussle in a sewer tunnel – the series’ most effective action sequence, hands down – and then it's on to Snow’s mansion for the climactic showdown. But just as the end is in sight, everything shifts. We won’t spoil things, except to say that the choices made are truly striking, simultaneously reaffirming the series' commitment to timely political point-making while providing an off-key but oddly satisfying sense of closure. Some will find the wrongfooting nature of the final scenes off-putting, and the pace can be ponderous. But it's genuinely powerful, thanks in large part to a peerless cast: Lawrence has rarely been better, and she’s matched – unexpectedly – by Hutcherson, delivering a peculiarly soulful turn. Stanley Tucci, Jena Malone, Woody Harrelson and Elizabeth Banks all make the most of their fleeting appearances – there’s a brief moment between the latter two which is simply beautiful. But it's one other bit-player who makes the biggest impact. This is Philip Seymour Hoffman’s final film, and, though his scenes are few, it’s an oddly fitting, heartfelt, sad-but-hopeful swansong. It was entertaining but not as good as the previous films in the series where you were on the edge of your seat in suspense.However, the death defying games part was still very creative and well done. Jennifer Lawrence – played her character very well, a quietly confident, serious and determined survivor, waging a war against the oppressive capital. I've generally been disappointed with all of the films in the Hunger Games trilogy, so not quite sure why I keep going back to see them! However, I would say that Mockingjay Part 2 was my favourite of the 4. I'm not a massive fan of Jennifer Lawrence in it, however the action scenes and special effects were certainly impressive. The ending was sickening though - I really wish they had just cut the final scene! It wouldn't be at the top of my list of films to go and see at the moment, but it's certainly an easy, enjoyable film to watch. Mockingjay part 2 is better than part 1 but the bar was set low. That said, it's entertaing with good action scenes and graphics. I didn't find that 3D added anything to the experience which was a bit of a disappointment. I think the best way to describe this is as a well executed but predictable finish to the trilogy, I can't think of one particular bit that stands out above the rest but it provides closure and it was enjoyable. In my honest opinion, it's nigh on impossible to make a film as good as the book it originated from - I'd say both parts of 'Deathly Hallows' are a rarity in which the two match - but this task is made all the more arduous when one final book is split into two films, especially when there is no reason for it other than pure financial greed and anyone who loves 'The Hunger Games' books would be hard pressed to say that wasn't the case with the last two films. Gripping, emotionally exhausting & utterly absorbing, the books are wonderful and films 1 & 2 did an excellent job of bringing them to life. Unfortunately, the problem with splitting 'Mockingjay' in half means that some of the pace and desperation is lost. There's too much time and not enough happening in each part to fill it yet there are key moments that feel rushed and as though they're not given the screen time they deserve. The action scenes are well constructed and watching it in 3D made me nervous for the mutts long before they appeared on screen which is a feat well accomplished when you know what's coming next. Lawrence is as good as she's been in all previous films with none of the annoying 'cool girl' quirks that mark her out in real life now; you believe her and you root for her and you feel for her which let's face it, is pretty important for a lead character. It is however, the older generation whom you cannot take your eyes from, with Donald Sutherland being sincerely splendid as the assured-at-all-times Snow and Elizabeth Banks continuing to shine despite Effie's limited screen time. Love triangle components Liam Hemsworth and Josh Hutcherson are both perfectly fine though they hardly set the screen alight with the passion, rage & sorrow depicted in Suzanne Collins' books. The movie is beautifully scored and the scenes in the last 20 minutes are moving in their simplicity although the coda was nowhere near as powerful as it reads in the book. It felt like an add on, an afterthought if you will which is an impression never given on the pages. It's still a film absolutely worth seeing because sometimes you get so caught up in the people you read about, you can almost forgive any flaws in their on-screen incarnations but there's no doubt this would have been a stronger and more impactful film in one sitting and I was sad when the credits rolled on my time within the world I'd grown to love. Enjoyable? Sure... Fast paced and gripping? Satisfyingly so... Award winning performances? Probably not, but they did the job... Will I remember this film in years to come? No. Having excitedly waited a whole year for the final 'Hunger Games' film to come out, it was a bit of a let down. I'm not one to hate on films, I'll happily watch the worst of them, but the ending was quite simply dull. I'm all in favour of cheese, but this just stripped the entire franchise of everything I believed it to stand for. My final thoughts were: 'Really? That's how they decided to end it?' and I guess that's all I'll remember in years to come. So all in all, you might as well see it, on a big screen is probably better but you wont leave thinking anything more than - 'it was okay'. I'm so pleased I wasn't deterred by the disappointing Part One because the last action-packed installment of The Hunger Games series really delivered. Bringing what should have been a trilogy of films to a massive climactic end, Part Two managers to visualise the horrific events of the book effectively giving you the emotional punch in the stomach required as well as the epic action scenes. It's not art, it's not groundbreaking but it's entertaining and I'd happily watch it again. It took a while but the unnecessary second part of the worst book of the trilogy got out and the story was closed. I only went to watch it because I had read the books and watched all the previous films so I didn't want to be left half way. However, the film just simply is not good. It's inaccurate at parts and makes it obvious how unnecessary it was to split an already boring book in two films. No clear explanation is left about what happens at the end of the film and why it was like that. And not only is the storytelling weak. The acting is nowhere near the level of some of the actors. It's as though they didn't care too much about the film itself. It an OK film and that's it. Only worth if you've watched the previous films already. But if you haven't, don't even bother and go straight to the books. They're not legendary prose, but at least you'll be entertained and get the whole story. I'll preface this by saying that I've not read the books so I am unable to judge it in that context but I have seen all the other films. I felt that this was one of the strongest in this series of films, the previous 2 I have felt a bit more ambivalent about, but I enjoyed this one. The whole concept of it being a war of propaganda is explored much more strongly here and some reservations I have had about certain characters have been borne out. Trying not to give to much about the ending away, I was also pleased at how it explores the initial consequences of revolutions generally and felt that it did so very well. My complaints would be that the ending is a bit predictable (although fairly good even despite that) and the romantic drama a bit heavy handed, but I also realise that I am not the primary target audience for this. I also would have liked it to end just a little bit earlier as there were some scenes that I felt were unnecessary. Over all I would recommend this film. The film was nothing short of what was expected of it, it was just as exciting as the rest of the movies and overall if you enjoyed the other three, you should enjoy this one. The film's action and special effects are very well made. As a fan of the books I was not disappointed at all, some people disapproved of the ending and called it 'too boring' I disagree as I feel a slow ending is exactly what such an action packed set of movies needed. Definitely worth the money. Popped along to Clapham Picturehouse with my eldest (12 yrs) daughter yesterday. Was thoroughly gripped throughout. At time felt positively sick with anticipation. The film captures perfectly the excitement & adventure if the books as well as the genuine moral dilemmas faced by those who fight corruption & dictatorship. The effects were tremendous, it was almost like being on a ride! 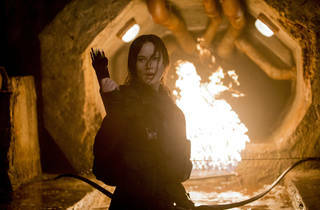 A big fan of the Hunger Games series of books and films, I approached the final installment with some trepidation. The third film had made me lose my faith somewhat, as they cynically stretched the final book into a drawn-out two film finale. I worried that they had lost momentum. My fears were assuaged - somewhat. The action of the fourth film benefited from having more time to explore it. However, the film suffered in its faithful retelling of its source material. A core problem of "Mockingjay" is that Katniss is reduced to a weak element in a boring love triangle - and the film also focused on this (I assume to cash in on the Team Peeta/Team Gale audiences). The longing looks and the number of false, dull kisses did get a bit old, and the subtlety of some moments was lost in film, as we were not privy to Katniss's reflections. This was also true at the end, where we did not witness the nuances of her final reflections. What was lost, however, was more than made up for in the interpretation of the key action sequences. There were some standout moments - the tunnel scene in particular was adapted spectacularly. The impact of the body count also hit home much harder in film than in text, as even the deaths of bit characters are much more impactful when you can actually see them. In all, I was happy with what I saw. It was an excellent afternoon's watching, and I look forward to viewing all four films in some mega-movie marathon at some point in 2016! The action parts of the movie were as good as previous parts of the series, and a step up from Mockingjay part 1, but I did feel as though there were lots of filler scenes where the characters moped around a bit and lamented over who Katniss would pick from their odd little love triangle. That said, it was entertaining and if you've seen the previous installments or read the books you know what you're getting yourself in to. Shout out to Snow's impressive wardrobe of velvet smoking jackets - looking dapper as always! It's an entertaining movie and the end of the saga but it's far from amazing. Loads of action but everything was a bit predictive. The final chapter, and it is a cracker. A more subdued installment of the Hunger Games, focusing on the task in hand, the rebels have reached the Capitol , the Mockingjay finds herself not only a pawn of Snow, but now also of the rebel leader Coin. The acting is astounding, the message clear, war is a muddy grey area, no winners, no losers, just loss and pain. It is a profound story and not to be missed.